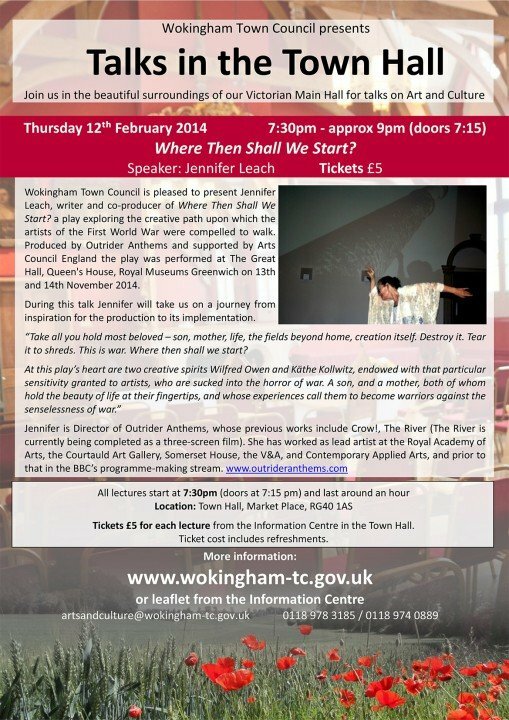 Jennifer Leach (Reading artist/writer and Director of Outrider Anthems) will be giving a talk at Wokingham Town Hall about her recent project which looks at the lives of a poet and an artist in the context of WWI. A mixed-media artist exploring the attitudes, interests and concerns of the present day as inspired by the surfaces and structures of the built environment. I use photography and digital print as part of a wider mixed-media practice including sculpture and site-specific installations. An integral part of my artistic practice is working with other artists and art students as a freelance tutor, workshop leader, lecturer, writer and blogger about contemporary art.